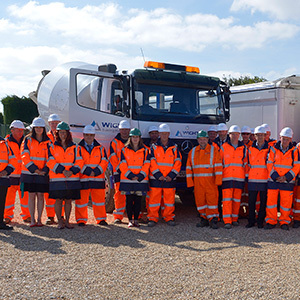 This week saw the official launch of Wight Building Materials , the joint venture between Eurovia and Aggregate Industries to supply asphalt, concrete and aggregate materials to local businesses on the Isle of Wight and to service the 25 year Highways PFI. As Island Roads intensify their surfacing programme, Wight Building Materials made their first deliveries of asphalt materials including two key products: Foambase and ULM. Foambase, HD, is an energy efficient, low carbon emissions process which re-uses material removed from the existing carriageway and recycles them into a high quality, durable road foundation material. Not only does this reduce Co2 as it is cold process but it also avoids the need to use virgin aggregates. ULM is a durable, quiet road surfacing material, which has a proven track record in the UK and around the world. It reduces vehicle noise in residential areas, maintains skid resistance and enhances vehicle ride comfort. Additionally investment in Blackwater Quarry, St Georges has started with the purchasing of a new modern asphalt plant.